Wetaskiwin Grands 4 Africa held a tremendously successful luncheon and program in support of the Stephen Lewis Foundation in its work to support grandmothers and community recovery in 15 of the African countries most affected by the HIV/AIDS pandemic. The lunch itself, prepared and served by the Wetaskiwin Grands, was exceptionally good, both nutritionally balanced and very tasty. The program was interesting throughout as it provided both information and entertainment. 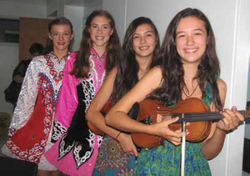 The finest of entertainment was provided by four granddaughters, two of whom played violins and sang, and two of whom performed Irish dances, all at such a high level that it was pure pleasure to see and hear them. There was a general sense of awe at their exceptional abilities. There was also a fashion show using clothing from the Salvation Army Thrift Store and from The Other Side. Two children modelled Beauty and the Beast, and it concluded hilariously as Sylvia Larson hammed it up in pre-bed attire. Interspersed with the delightful entertainment was information about the Stephen Lewis Foundation and about Wetaskiwin Grands 4 Africa. There were also tables set up for the sale of baking and gently used items of jewellery, scarves, books, etc. as well as Aids Angels made by the members. The Wetaskiwin Grands 4 Africa raised $4,600 in total at this event. group” who welcome grandmothers and, “grand-others” to join their cause. Stephen Lewis, formerly diplomat and Canadian Ambassador to the United Nations, set up the Stephen Lewis Foundation in 2003 with a vision of providing financial assistance at a practical level to community groups who were already identifying local needs and ways to meet those needs. From the beginning, the Foundation recognized that the small grassroots groups that were already working to restore lives and hope were primarily made up of women. It noted that community leaders were the ones who “identified gender inequality as the driver of the pandemic.” Since then, the Foundation has committed over $75 million to fund over 1100 initiatives in partnership with more than 300 community-based organizations in 15 of the African countries hardest hit by HIV/AIDS, from Ethiopia to South Africa down the east and central part of the continent. In 2006, Stephen Lewis’ granddaughter recognized that the grandmothers were a key part of the situation as they struggled to raise their orphaned grandchildren, and suggested the Grandmothers to Grandmothers Campaign. Since then, 250 grandmothers’ groups have been formed across Canada, and have raised more than $21 million which go to African groups who support grandmothers’ immediate needs such as nutritious food, healthcare, transportation, adequate housing and bedding, school fees and uniforms and supplies for orphans, as well as longer term needs from bereavement counselling to business skills and micro-credit grants. The Stephen Lewis Foundation strives to keep administrative costs to a minimum while recognizing that accountability requires actual visits to the communities to see the work being done and the levels of community care, conviction, expertise and accountability of the local organizations. This balanced concern finds 90% of the funds raised by the Grandmothers to Grandmothers Campaign actually reaching the grandmothers in Africa. In identifying organizations that are rooted in and accountable to their communities, the Foundation looks for women and people living with HIV and AIDS on their boards and staff, a gender-based focus to their programming, and counselling and emotional supports available to help families, workers and the community deal with the trauma and grief. The Foundation appreciates the flexibility inherent in community based organizations as they discover more needs and ways of helping, and evolve readily as circumstances change. The Foundation also remains involved to ensure the sustainability of the works it supports. Further information about the Stephen Lewis Foundation is available at www.stephenlewisfoundation.org. Further information about the Grandmothers to Grandmothers Campaign is available at www.grandmotherscampaign.org.